The British Guitar Academy is the latest project of Steve Rothery - guitarist with multi-million selling band Marillion. It kicks of with two masterclasses this February in Tring, Hertfordshire. "The idea for the BGA came to me after I'd done a guitar and production workshop at the Apple centre Soho in New York. There is something very special about British guitarists, maybe it's the fact the our roots lie in traditional folk music instead of blues or jazz or maybe it's that we feel the need to express in music the misery of living in our cold and damp climate. Whatever the reason, we've produced some of the finest and most individual musicians and music in the history of pop and rock. "My idea with the BGA was to bring together some of Britain's top guitarists to pass on their hard won knowledge and experience to a wider audience through a series of workshops and masterclasses. The aim is to concentrate not just on technique but also creativity and individuality. "The web site is also a very important part of the BGA. We'll have a free youtube channel featuring basic guitar lessons, equipment reviews and name guitarists talking through and demonstrating their live rigs. Later this year there'll be a subscription based online modular instruction course featuring a selection of great players each explaining their own style and philosophy of playing." At each of the first two BGA events to be held at The Court Theatre, Station Road, Tring, Herts. Four different guitarists will talk about their experiences as players and how they have evolved as a musician. This will include advice on writing, recording and touring. 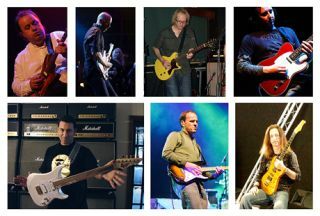 The masterclass will also feature demonstrations of advanced techniques with tips on establishing your own sound and identity as a guitarist. The doors at each event open at 1.30pm with the clinics running from 2pm to around 6pm. Each player will give a master class of approximately 45 minutes followed by a short Q & A.
Steve Rothery - guitarist with Marillion & The Wishing Tree. Aziz Ibrahim - guitarist with Simply Red, The Stone Roses, Ian Brown and Asia and a solo artist. Dave Foster - guitarist with Mr So & So and a solo artist. Michael Casswell - guitarist with Brian May band, Cozy Powell band, Tony Hadley, Ronan Keating, Gwen Dickey (Rose Royce), Limahl (kajagoogoo), Wang Chung, Rhino Edwards (status quo). Guitar instructor at the Brighton Institute of Modern Music, Academy of Contemporary Music in Guildford & Lick Library. Matt Prior - guitarist / producer with Bonnie Tyler and tv & film music composer. Rob Harris - guitarist with Jamiroquai since 2000, writing and performing on their last 4 albums . Has also played with The Pasadenas, Mark Owen (Take That), Kylie Minogue, Beverly Knight and Don Airey (Deep Purple). Dan Steinhardt - guitarist with Tin Spirits, developer of the Gig Rig pedal switching system and acknowledged tone guru.